That was a case where a store was closed, and online sales did not increase. When the store closed, customers simply went elsewhere. The market lost nearly half of the sales that existed when the store was there. Now, if you look at top-line sales and care about sales growth, that's a problem. If you are a CFO and care about profitability, you don't care one bit about that as long as profit increases. This is where market-level profit and loss statements come into play. Smart retailers have market-level profit-and-loss statements for every market, based on forecasts for what happens when a store closes. Here is an example in a market where there is just one store. When the store closes, the market is forecast to become more profitable. The incremental value of the store in the market is negative. The store generates $640,000 of in-store retail sales. The store actually suppresses $200,000 of online sales. And in total, the store loses $19,200 profit. Catalogers went through this process 10-15 years ago. Catalogers produced profit-and-loss statements for individual catalogs, using mail/holdout tests, determining whether catalogs truly added value or not. We did this at Nordstrom. We knew that catalogs were break-even propositions in terms of incremental value. Catalogs were killed. Game over. Customers didn't care. Profit actually increased. 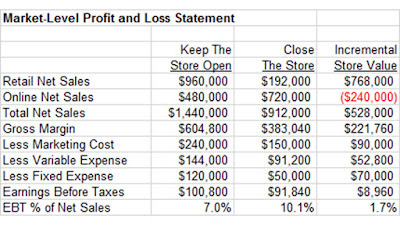 Smart retailers have market-level profit and loss statements ... for every market (often for individual store trade areas). They know what needs to be done. At an Executive Level, the discussions become interesting. Does the "brand" need to produce $440,000 of net sales that generate a loss of $19,200? The room rapidly splits into two camps. Market-Share and Growth advocates immediately say "YES". They lobby to keep the store open (we can't shrink our way to growth - the loss is a small price to pay to protect the brand). Profit advocates immediately say "NO" (there is no reason to run a business that generates sales at a loss, if you believe that is the right decision, why not take a pay cut). 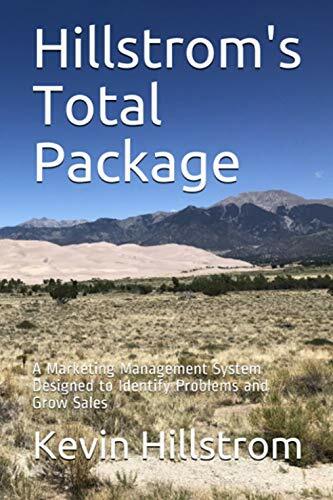 The analytical guru typically creates a scenario illustrating what it takes for the store to generate positive incremental profit. Look at the scenario below. 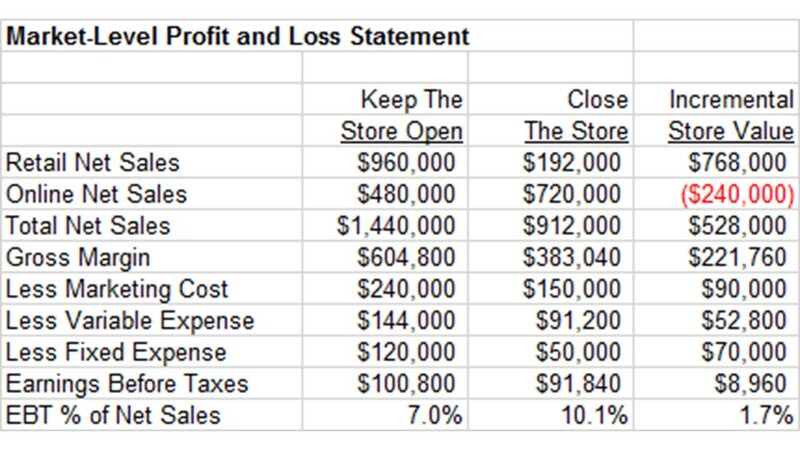 The "market" needs a 20% increase in merchandise productivity in order for the store to generate incremental profit ... and even then, the store is generating $8,960 profit on sales of $528,000. We all know that merchandise productivity is not going to increase by 20% ... that hasn't happened in more than twenty years (pre-internet), right? This is why stores are closing, my friends. 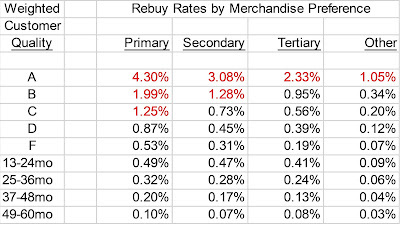 Market-Level Profit-And-Loss Statements coupled with forecasts for future retail cannibalization and future merchandise productivity indicate what is best for the market in question. Forecasting skills have become critically important in modern analytics. 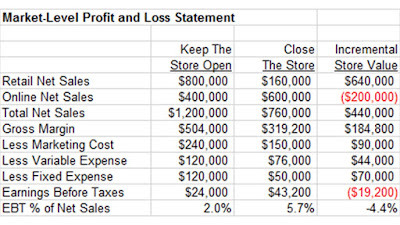 Market-Level Profit-And-Loss Statements have become critically important in modern retailing. Give me a holler (kevinh@minethatdata.com) if you need help with forecasting and market-level profit and loss statements.